103 colour illustrations 141 black and white illustrations. 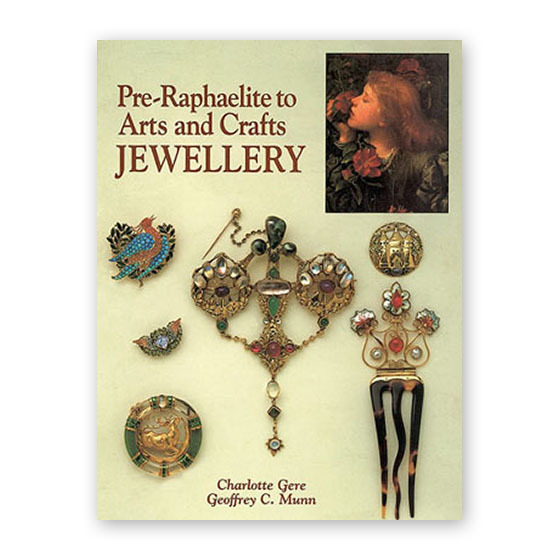 This richly illustrated book covers one of the most fascinating yet poorly documented periods of jewellery design. The Pre-Raphaelite Brotherhood was a group of young, rebellious artists whose work reflected their deeply romantic private lives. They believed that decoration was as worthy as painting and sculpture, and took pleasure in designing everyday objects, including jewellery, for their personal use. Many of their paintings featured jewels full of symbolism and secret messages, such as the pansy, lilies of the valley, or the dove, all explained in the text. Towards the end of the 19th century, their ideas were superseded by others, culminating in the Arts and Crafts movement which reverted to simpler designs with much less intricate detail. Each of the movements had artists and jewellers who have subsequently become closely associated with them. This remarkable and carefully researched book traces the stories behind jewels designed and owned by these artists, often right back to the original drawings. Many entirely new discoveries are featured, including Rossetti's watch, a necklace designed by Sir Edward Poynter and worn by his model for 'Helen of Troy', and a cross by Sir Edward Burne-Jones commissioned by John Ruskin in memory of Rose La Touche. The book deals with intensely personal souvenirs of romantic and even blighted love. Amongst the illustrations are works of art from royal, aristocratic and artistic circles, and some of the finest collections in Europe. Artists featured include Dante Gabriel Rossetti, Sir Edwin Lutyens, William Holman-Hunt, William Morris, Charles Ricketts, William Burges, Henry Wilson and John Paul Cooper. The pieces were made by eminent jewellers such as Carlo Giuliano, Hancock's, Child & Child, and Barkentin & Krall, and some were presents for prominent society ladies such as Margot Asquith and Ellen Terry. Jewellery from this period is avidly sought for its famous romantic associations. As the artists had little respect for the intrinsic value of the materials used, undiscovered jewels may previously have been overlooked but today could be of great value and importance. As many as 30 designs appear for which no jewel has yet been traced.